Several years ago when we headed back east to visit our family, Marc’s mom asked if we wanted to attend her “laughter therapy” workshop. Our first reaction was “what?” Being the persuasive mom that she is, we said yes and before we knew it, we were surrounded by a bunch of senior citizens in a room filled with giddy laughter. At the time, the concept of laughter therapy sounded a bit quirky to us. We’ve all heard the saying that laughter is the best medicine. If that’s true, then we should be looking for more ways to laugh, right? The good news is that there are plenty of places that promote laughter. 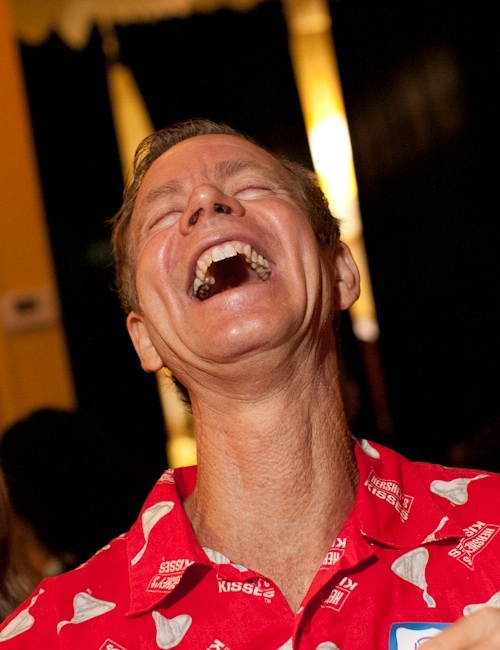 For instance, did you know laughter yoga classes are held every week and are free? We checked out the Saturday Balboa Park class and initially, we had our doubts. As we parked our car along Sixth Avenue, Mother Nature wasn’t cooperating. The skies were grey and it was drizzling. Going to a laughter yoga class did NOT sound appealing, but that’s when we met three friendly-looking women, all headed in the same direction. Gladys Munguia said this was her third time attending the class and that it’s a great way to relieve stress. Minutes later, we met Louis the laughter yoga instructor and the rest of the class. There were 24 students, which Louis said was surprisingly big, especially for a drizzly morning. There were a few late-comers who commented on the rain but that didn’t discourage the group, they just smiled and said “Come on over, it’s all happening!” From that moment on, we knew we were exactly where we wanted to be. Our favorite part of the class was the laughter shower. Approximately seven to nine people would form a small circle and close their eyes. The rest of the students would surround them and “shower them” with loud laughter. Granted, it might sound a little odd, but don’t knock it untll you try it. It’s definitely a feel-good, positive exercise. “It’s so important we laugh every day,” said Michael Coleman, who heads up the classes and is the founder of the non-profit group Laughing Matters. “Studies show that laughing relieves stress, it lifts our moods and it’s good for our minds and bodies,” said Coleman. Rebekah and Justin Hollister couldn’t agree more. The couple opened The American Comedy Company on Sixth Avenue this year, so they see first-hand how laughter can be a blessing. 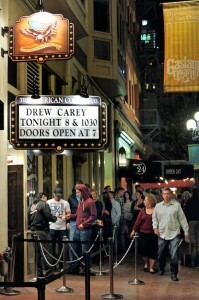 Since its grand opening in March, the shows consistently sell out, proving that people do indeed like to laugh. We got tickets to a recent show featuring Filipino-American comedian Rex Navarette and there was non-stop laughter going on that night. Mary Baristas who saw Navarette’s show with a group of friends said it was the perfect way to forget about her stressful week. “I go to comedy shows at least a couple times a month because it helps me to lighten up and it’s cheaper than therapy,” joked Baristas. They hold various classes including Laughter Yoga and Sitting classes at senior homes. Rebekah and Justin would love to see you laughing in their audience. This is an interactive, improv-style comedy show that encourages audience participation.